nga‐njilngmak bu nga‐bekkan wanjh gandi‐bidyigarrme ba garri‐djarrkbolknahnan. World Heritage wanjh ga‐mak garri‐bolknahnan munguiyh‐munguiyh. to see all of us looking after this place. Corporation, representatives of which are here with me at this meeting. I want to ensure that the traditional laws, customs, sites, bush tucker, trees, plants and water at Koongarra stay the same as when they were passed on to me by my father and great‐grandfather. Inscribing the land at Koongarra as World Heritage is an important step in making this protection lasting and real. For Koongarra was finally added to the World Heritage List. And much of Jeffrey's Lee's efforts were documented by theweathergroup_U – activists and film-makers who are now showing the latest results of their filming at 24HR Art in Darwin. An early version of the Koongarra struggle was seen at the MCA in Sydney in 2010 during its In the Balance ecological art show. This exhibition has also showed film made by weathergroup members of the on-going mining disaster at Sidoarjo in Java where an unstoppable mud flow has wiped out villages and fields. And the last Sydney Biennale saw their important film about the work of Indigenous Rangers in fire and weed control in remotest Arnhemland. This resulted from the April 2008 meeting of the UN Permanent Forum on Indigenous Peoples in Darwin, discussing ‘Indigenous Peoples and Climate Change’. theweathergroup_U attended and heard stories of pressure on forest livelihoods, of rising oceans and biopiracy, of ice melting so rapidly that it stretched the ability of traditional knowledge to read the once icebound coastal environment. They also encountered Dean Yibarbuk, a traditional owner of Arnhemland escarpment country and began exploring the Western Arnhem Land Fire Abatement project (WALFA). 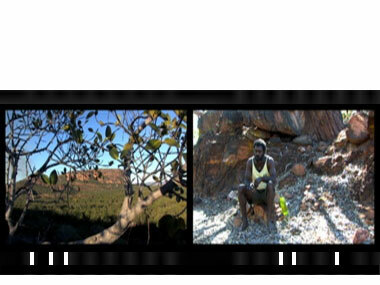 Dean is part of Wardekken Land Management Ltd., one of 6 organizations of traditional owners employed as rangers on their own country from Bulman to Maningrida. Funded for 17 years in a deal with US energy giant Conoco Philips to ‘offset’ CO2 from their huge new gas-fired power plant in Darwin, the project is re-igniting the traditional practices of Yolgnu controlled burning, although adding in helicopters, landrovers and state-of-the-art satellite mapping systems. In abeyance in remote Arnhem land as people have been confined to, first the missions and now the towns, cultural burning practices are being revived. As they reduce the intensity and spread of the dry season bushfires, they also reduce the amount of CO2 released to the atmosphere. A side-effect has been the enabling of autonomy and the reconstitution of culture ‘on country’, supporting the aims of the ‘outstation movement’ among those Arnhem land people who wish to leave the malfunctioning towns and return to live on country. But back to Koongarra, and Jeffrey Lee's pilgrimage is not yet complete. There are ongoing meetings with the Federal Government, the Northern Land Council and the French mining company as Lee pushes to get the boundaries of Kakadu National Park changed to include this area. Until this decision is made, Jeffrey Lee's fight to protect Koongarra for future generations continues.